Toho Bead Contest Winner. Sweet Creek Inc. Sponsers International Contest Winner! Winner and Sweet Creek manager win a trip to Japan! 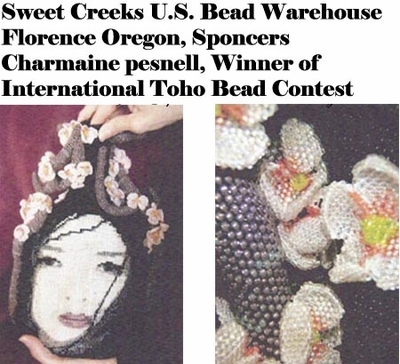 Represented By Sweet Creek's U.S.Bead Warehouse in Florence Oregon, Charmaine Pesnell, wins International Toho Bead Contest. Above view her winning entry of A Japanese Lady beaded on a bottle. On the right note the delicate flower work Beaded into the headress. The Piece is Called "Cherry Blossom"